One of the most appealing visual reasons to upgrade to Windows Vista will be this Flip 3D view, which lets you display all the currently open windows and select one using the mouse scroll-wheel or cursor keys. If you're thinking about a new PC, do you need to make sure it's Windows Vista-ready? We examine the relevant issues for the musician. Microsoft are expected to have released yet another Beta version of their forthcoming Vista operating system by the time you read this, but as I write in early 2006, people intending to upgrade their PC or buy a new one are already wondering whether it's worth trying to make it Vista-compatible. After all, Microsoft hope to ship Vista before the end of 2006, and most of us want a new PC to last at least 18 months before it has to be pensioned off. When Vista does ship, hordes of PC enthusiasts will no doubt be queueing up to buy a copy, but those of us who have already experienced the moves from Windows 3.1 to 95, 98, ME, 2000 and XP will probably take a more cautious stance. I expect the majority of musicians to hold back for at least a month or two until the wrinkles have been ironed out, and some may wait until the first Service Pack is released, to cure the inevitable issues that only surface when large numbers of people install a new operating system. Given that many of us primarily use our PCs for making music, some may delay the move for even longer, or perhaps not make it at all. Windows XP eventually proved to be by far the most reliable Microsoft operating system to date for running audio applications, and installing a significantly different OS can be a gamble (look at the problems many musicians had at first when moving from Windows 98 to XP, and from Mac OS 9 to OS X). It will be unsurprising if some PC musicians are thinking that as XP ain't broke, why fix it? Moreover, Microsoft have announced that some of the originally Vista-only features, such as Windows Media Player 11, with its much faster database searching (handy if your on-line music library runs to thousands of tracks), the more secure Explorer 7 browser with tabbed pages, and some of the new Vista graphic features, will now also become available to users of Windows XP Service Pack 2. If this all comes to pass, there may not be quite the same urgency to buy a copy of Vista. Having said all this, it makes sense that any PC you purchase now should be basically Vista-compatible, so that if you make the move you don't have to scrap any components. The most fundamental decision is the motherboard/chip-set, and since the most immediately appealing feature of Vista is its 'Aero Glass' layered 3D look, with transparency, significantly greater graphics power may be needed. The GDI+ (Graphics Device Interface) sub-system used by Windows XP to display information on screens and printers is being replaced in Vista by a new 'desktop compositing engine' that relies on Direct X. Although Vista will also include a Direct X 10 update, there's currently no hardware available that fully supports its feature set, so the minimum requirement for the full 'Aero Glass' experience at the moment is a graphics card with hardware support for Direct X 9, plus at least 64MB of video memory. However, 128MB would seem more sensible, since minimum requirements often work but may not offer a smooth and comfortable experience. 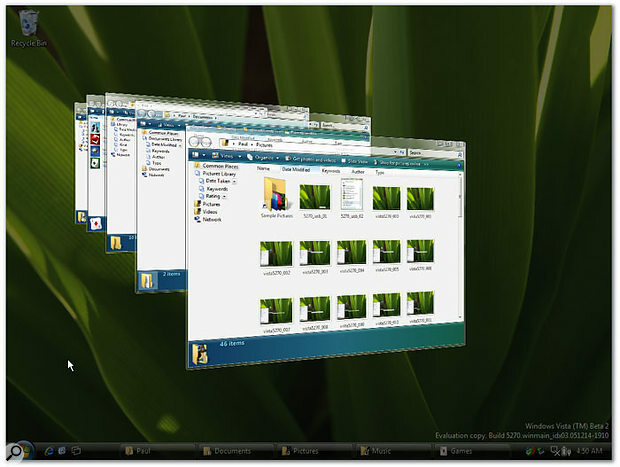 For those who might want to have lots of simultaneous windows open, and use new features such as the Flip 3D View (which gives you a perspective display of all open applications, as in the screenshot above, so that you can flip through them with your mouse scroll-wheel or cursor keys), 256MB or even more video RAM might be more appropriate. However, it remains to be seen whether or not musicians will object to the generally noisier cooling requirements of most of the higher-end graphics cards. I suspect that a PC with support for PCI Express is likely to be the best option for taking advantage of all the new graphic features, because the x16 PCI Express graphics slot offers a much greater bandwidth than the AGP slot. However, the graphics features can be switched off (or, as Microsoft put it, "Windows Vista is the first Windows operating system that has a user experience that can gracefully scale to the hardware capabilities of the computer it is installed on"), so don't despair if you've just bought a new PC based around the Nforce 3 or K8T800 Pro chip-sets, to avoid PCI Express audio problems. The significant performance improvements offered by dual-core processors mean that they are probably a must for partnering with Vista, especially as the popular dual-core ranges from AMD and Intel offer 64-bit as well as 32-bit capability (Vista is expected to ship on a DVD-ROM with 32-bit and 64-bit versions in the same box). Many industry experts are hopeful that 64-bit driver support will be much more widespread by the time Vista ships as well, so that may be the time to move over to a fully 64-bit system, abandoning any hardware items that still don't have suitable drivers. We can expect a bigger RAM requirement for Vista, with 1GB as a practical minimum, although 2GB is already becoming the new standard for DAWs (Digital Audio Workstations). If you opt for the full 64-bit experience it's also much easier to install 4GB and above. That will be a big help for musicians frustrated that they have to rely on streaming data from a hard drive when it could be accessed much more quickly if loaded into system RAM. Hard drive requirements aren't likely to change significantly: the hard drive demands of a music computer are more dependent on your sampling and audio needs than on your operating system, so the typical 80GB system drive and 120GB+ audio drive will still probably be perfectly adequate — although I expect 80GB drives to become increasingly scarce. However, faster SATA II models are likely to become more popular. Although most musicians don't need to combine drives into a RAID array for extra speed, the contents of large drives are increasingly tedious to keep regularly backed up, so redundant RAID setups, where one drive in the array can fail completely without you losing any data, will probably become more popular (apart from the extra noise). Microsoft are also encouraging drive manufacturers to develop 'hybrid drives', with much larger non-volatile caches of 128MB or more. Such designs will at first only be supported by Vista, but will allow frequently used files to be stored for very rapid retrieval. You could use this approach to enable Vista-equipped PCs to boot up or launch your most often-used applications more quickly. Intel have also suggested a similar scheme, but this time with their 'Robson' non-volatile cache mounted on the motherboard, so you could boot from that. It's even rumoured that Apple have already incorporated Robson technology into a new model of laptop. To sum up, I'm cautiously suggesting that to be fully equipped for both Vista and audio recording and playback you'll need a PC fitted with a dual-core processor, PCI Express slots, 2GB RAM, a PCI Express graphics card with 128MB or more video RAM, a DVD drive, and a hard drive of whatever capacity you want for your audio. If you're not particularly convinced that 3D graphics will enhance your music-making experience, PCI Express probably isn't so important, but if you are, it might be worth waiting until PCI Express cards supporting Direct X 10 appear. For the musician, it's the performance of MIDI + Audio applications that should determine whether or not we adopt Vista, but I'm almost certain that the major music developers are already getting busy with the latest Vista Beta release, so that they can have updates or upgrades of their applications available within a short time of the official Vista launch. This may be an ideal opportunity to offer new features (such as transparent mixer windows floating over the arrange page) allied to Vista's strengths. Voxengo Plug-ins: Aleksey Vaneev at Voxengo has once again been busy updating his ever-expanding but resolutely PC-only plug-in range, which now comprises over 40 products covering mixing, mastering, restoration and conversion. 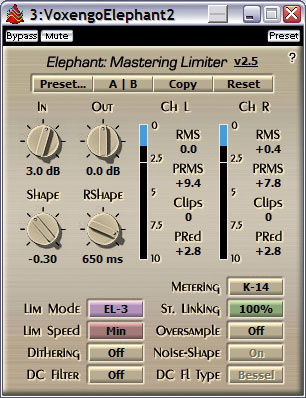 The latest updates are to the Elephant transparent mastering limiter ($69.95) and the R8Brain Pro sample-rate converter. The former has now reached version 2.5 and offers eight limiter modes and new Katz meter modes (you can read more about the Katz metering system in SOS October 2003, available to read on-line at www.soundonsound.com/sos/ oct03/articles/bobkatz.htm). The R8Brain Pro is now at version 1.3 and offers a new Ultra Steep sample-rate conversion mode, said to offer improved conversion quality. It costs $129.95, although a 'Lite' version is available for just $49.95 and there's a free version too. 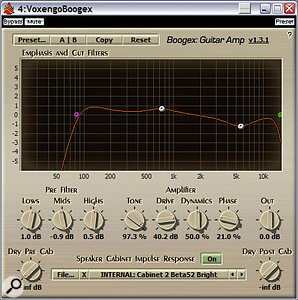 Aleksey now has a total of 13 free plug-ins available, including the Boogex guitar-amplifier plug-in, now at version 1.3.1. It offers traditional overdrive and distortion effects via its three-way pre-filter and the Tone, Drive, Dynamic, and Phase controls of its amp simulator, but also provides a set of Impulse Response files that model various speaker cabinets and the way they've been miked up. Convolution is now being used more and more to add realism to plug-ins. This is Voxengo's freeware Boogex guitar-amp simulator, which includes a selection of mic/amp/speaker impulse responses. 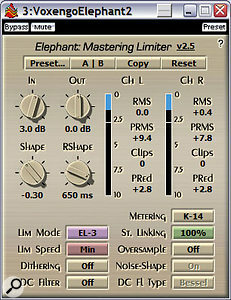 The latest version of Voxengo's Elephant mastering limiter includes three 'K' metering modes, as favoured by world-famous mastering engineer Bob Katz.Convenient Cable: Have you ever needed a PC or video cable that you can't find in a local shop, then located it at a bargain price on-line, only to discover, after negotiating the virtual shopping experience, that the price jumps hugely once postage and VAT are added? I now buy from Cut Price Cables, where the quality is high, the prices are competitive, VAT is included in the price and delivery is free, so there are never any nasty surprises. They stock most of the most common computer, TV/Video and computer-related audio cables (including S/PDIF and optical), plus other useful items, including phono preamps and Firewire cards. All orders received before 4pm Monday to Friday are despatched the same day.